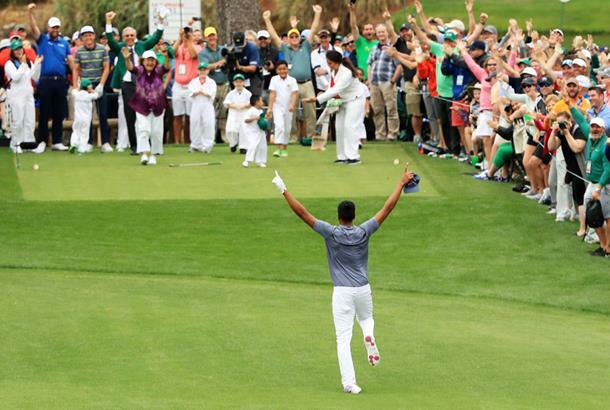 Tony Finau has said he is ‘optimistic’ that he can play in The Masters after it has been confirmed he didn’t break his ankle while celebrating a hole in one during the Masters Par 3 Contest. Finau was running in celebrating when he dislocated his ankle, and then was seen to pop it back into place and play on. Following the end of the Par 3, Finau declined all interviews and it was later confirmed by the Golf Channel that X-rays done on Wednesday night revealed no breaks. He will still undergo an MRI on Thursday morning, and hopes to play if results are positive and swelling is under control. Watch the video below, but beware- it is quite gruesome!